Overwhelmed by the amount of reading you have to do on CULPA? 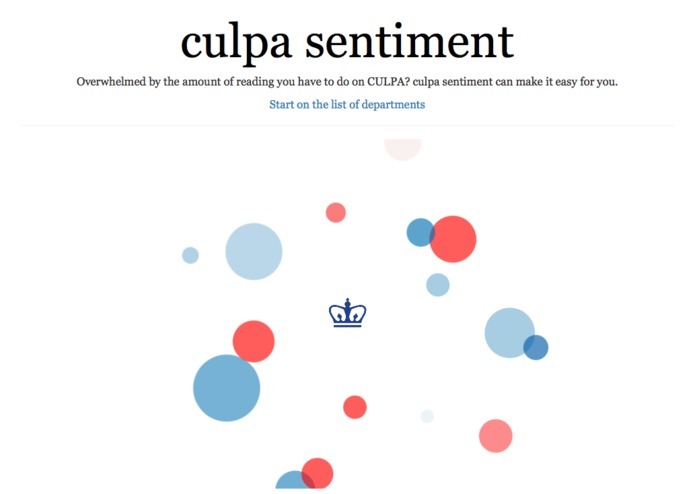 culpa sentiment can help. 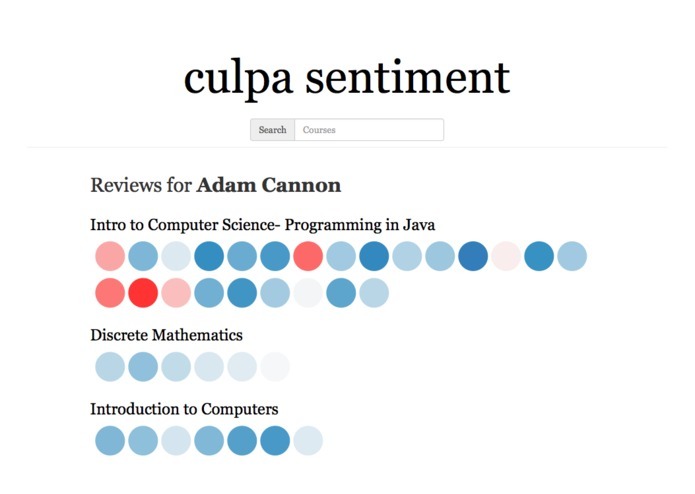 culpa sentiment performs sentiment analysis on the reviews posted on CULPA to give users a quick summary of the many reviews for the courses at Columbia University. 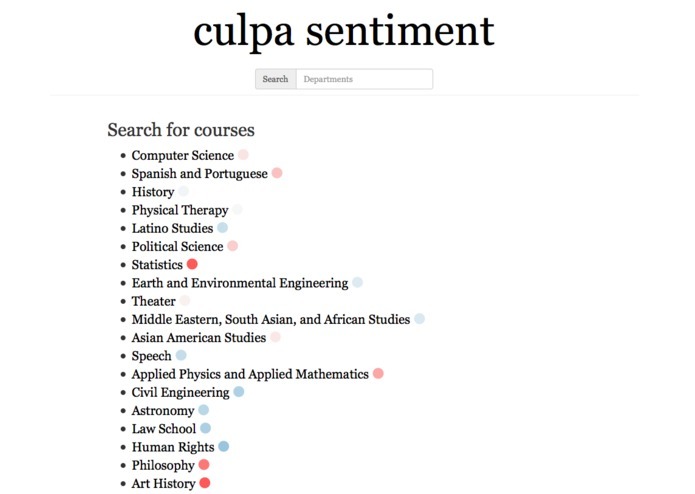 CULPA has a lot more useful information about the courses and the professors at Columbia than any other resource, but the amount of text of some of the courses/professors makes it overwhelming to get a quick overview for course selection. We wanted to make this better. 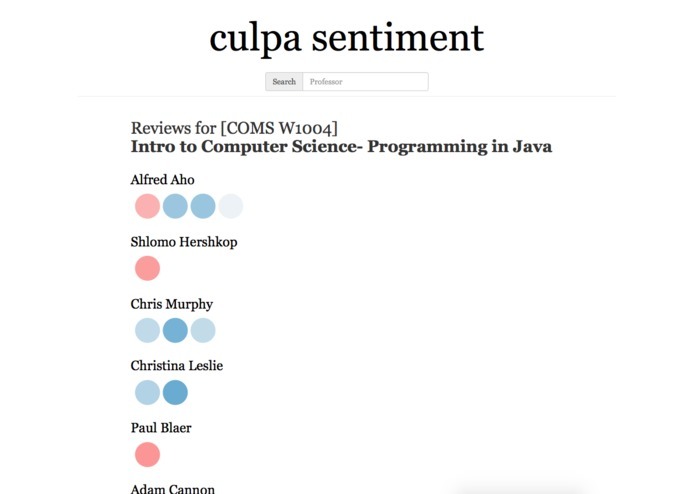 The reviews are collected from CULPA using the CULPA API and fed to the Alchemy API for sentiment analysis. 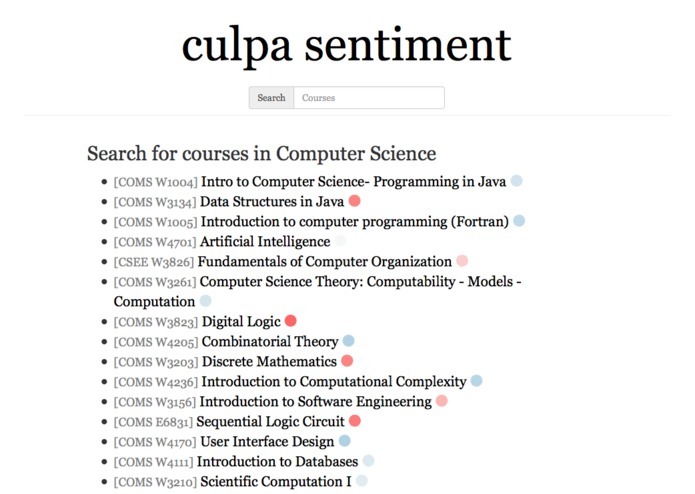 The results are organized and summarized in a way that is the most useful for browsing and selecting courses at Columbia. The result provides both the overall sentiment analysis as well as possibly important keywords from the review. Python was used to interact with the CULPA and Alchemy APIs and create the database (PostgreSQL). On the front-end, we have d3.js providing the figures and jQuery handling the document structure and search functions. API query limit was the hardest one really. Without a paid account, we were limited in terms of how many reviews we can perform sentiment analysis for. The entire thing really, it was incredibly cool to see how well the analysis performed and seeing how the ratings are generally consistent from person to person. Stay up long enough, you get things done.